Some times, cooking comes naturally, like breathing. Other times, cooking must be learned, like riding a bicycle. I've ridden this salad-dressing and simple-vinaigrette 'bike' for so long, it now seems like breathing. I make it every day, some times twice. I often use good ingredients, good olive oil, good vinegar; mostly I use the every day stuff. It's always the same, it's never the same, both at once except that it's always good. When I make it for others, I get quizzical looks. "What IS this?" I hear. "It's my favorite salad dressing," I answer. "I'll show you." Many years ago, it was Ann Lemons who showed me how to make salad dressing. She and husband Joe Pollack are big shots in the St. Louis food world, with piles of credits to their names. Ann and Joe are blogging now. 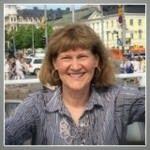 This post is my way of saying Welcome to the world of food blogging -- and to thank you, Ann, publicly, for teaching me how to breathe, even as I, in turn, teach others. This salad dressing recipe was first published in a 2003 Kitchen Parade column featuring a trio of salad dressing recipes. 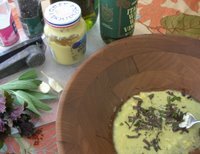 Along with My Favorite Salad Dressing, there is Buttermilk Balsamic Dressing (easy to make ahead and store in the frig for a week or so, best of all, it's a rare salad dressing with zero Weight Watchers points) and Traditional Balsamic Dressing (delicious and worth an occasional splurge). This is not a recipe, per se, but a simple concept. Once you learn the concept, you'll never need a 'recipe' again and can easily adapt the ingredients for your own taste profile and the quantities for a single serving to a crowd. For starters, use a garlic press or a fork to mash a garlic clove in a salad bowl. If you prefer a hint of garlic, rub the clove along the bowl’s sides and then discard it; you can also substitute a dollop of a garlic-ginger mixture that’s often found in produce sections near the fresh garlic. Add some salt, then a dollop of a favorite mustard. Rub these together with the fork. Pour in a double splash of vinegar, your choice, but the less harsh the vinegar, the better the dressing. With the fork, whisk the vinegar into the mustard-salt mixture. 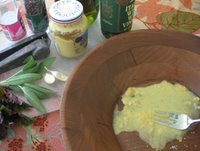 Now add a splash of good olive oil (this is a time to bring out the extra virgin olive oil) and whisk again. The traditional proportion of oil:vinegar is 3:1 but I’ve come to prefer considerably less oil, closer to 1:3. Add some freshly ground pepper. Taste the dressing, then adjust the ingredients to mirror your own taste profile. If you wanted a simple oil and vinegar dressing, you're done! But if you feel exotic, add chopped fresh herbs and/or grated Parmesan. Taste the dressing again. It's good, yes? 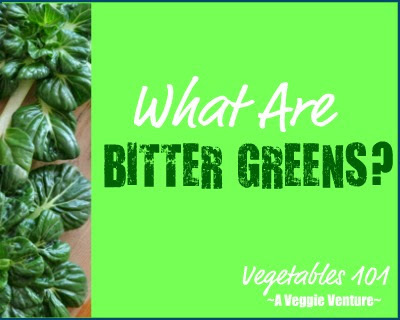 Once you're ready to serve, add the salad greens and any other salad ingredients. Toss them into the dressing (your hands will be most efficient but salad servers work too) until the greens are covered, everywhere, with dressing. Grab a fork ... and enjoy! Do experiment with ingredients: it’s fun, it's always worth eating . And in no time, you'll find yourself looking forward to an always-new, always-fresh salad. Whoa! That's MY house dressing...has been for years! I usually mash the garlic with a knife and then fish it out just before serving, but otherwise, that's it! Glad to find myself in such good company! Excellent! Thank you Alanna - I will definately try making dressing this way! This is great! My family thinks I'm a genius for making this and I try to demure, "oh, it's not so hard..." Thank you for illustrating it in such a way that all can take confidence! BTW, I often add something briny like capers or olives. 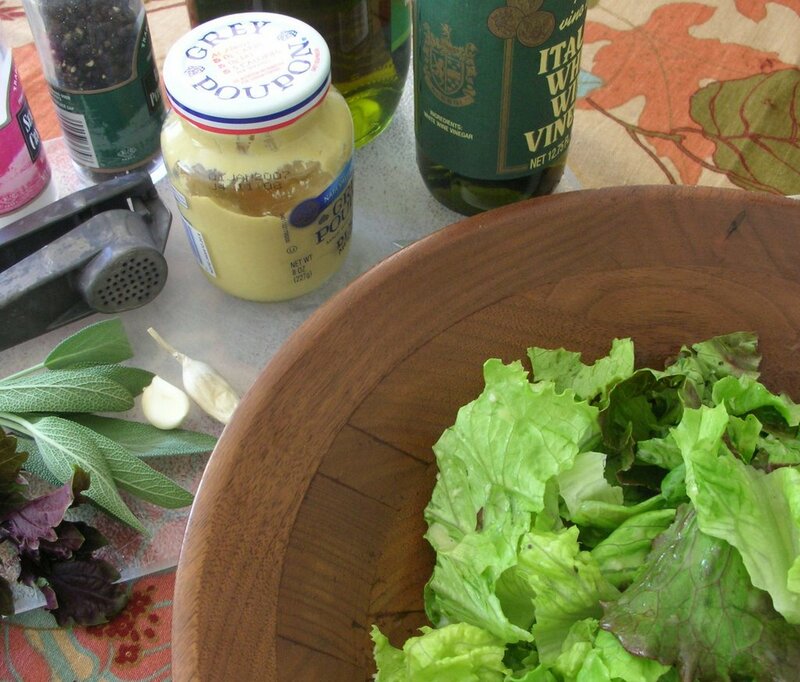 My, my, quite a rush, this simple salad dressing! I'm glad it's hit a good chord, familiar and otherwise. Others ~ Add your own salad tips, it looks like we have a chance to inspire lots of salad-making! I just stumbled upon your website. Kudos to you from a fellow veggie lover and St. Louisian. I cannot wait to try your salad dressing recipe. I agree with wheresmymind (and I often wonder where emine is): Once you start making your own, the stuff at the store tastes pretty bad. So many homemade salad dressings have mustard in them, and I can't stand it. Without it, there often isn't enough "flavor," and I'm not sure what little extra something it needs to come together. Any substitutions for mustard you can suggest? Hi Zoe ~ Interesting question. You're looking for something with a little zing (acidity) with flavor (but not too much, you don't want it to take over). Maybe tomato paste or anchovy paste? Or maybe black bean sauce (though it's got piles of flavor)? Or a horseradish-mayo mix? You might check the salad dressing recipes from the archives and instead of trying to replace the mustard, find recipes without it that have lots of flavor. Take a special look at the Orange Cumin Dressing. re: mustard, presumably you've been trying good mustards, not just the yellow stuff? It makes a huge difference, if by chance not. Dijon is the classic but I have a favorite Finnish mustard and love the stone-ground mustards from Germany. Substitute a little honey or molasses or tamarind paste, any fruit paste will do. You might also enjoy a nut butter like tahini or cashew butter instead of mustard. Try adding a little paprika or, if you are adventurous, cayenne for extra zip!! Just made this for the first time, and I like it! I overdid it with the vinegar, so I plopped in a teaspoon of chili sauce and a squirt of srirachas. Went perfectly with the mexican theme I'm rocking for dinner. Black beans, corn, red peppers, jalapenos, cilantro, cherry tomatoes, and some romaine. Thanks for this excellent how-to guide!